Our Stainless steel films, which we refer to as EZ Faux Steel, will instantly give your appliances, or any smooth surface, the look of stainless steel. Perfect for use on the following items: appliances, backslashes, ceilings, walls of boat cabins, doors, metal cupboards, video recorders, trash cans, counter tops, shelves, workbench, tables, desks, and more! 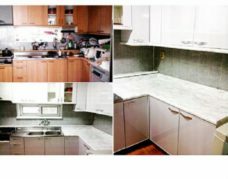 Faux stainless steel is installed without additional adhesive, scratch resistant, durable, heat resistant, and it is easy to clean. 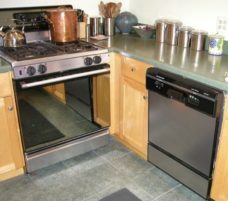 Stainless steel appliances for a fraction of the cost!